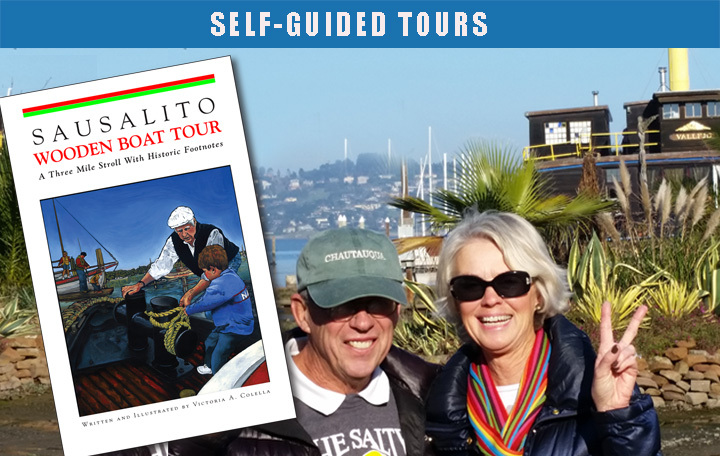 Sausaltio Wooden Boat Tour guide book by Victoria Colella - 2016 Edition Now Available! DOWNLOAD YOUR 2016 DIGITAL EDITION NOW! This popular guide book educates and delights locals and visitors alike. Sausalito artist,sign maker and author, Victoria Colella. Wooden boats and historic vessels lead the way! The book includes 94 pages of color photos, illustrations, directions and maps. Victoria Colella, a remarkable artist, cultural guide and author, has just released the third edition of her engaging book, The Sausalito Wooden Boat Tour. Now available in limited edition, it contains nearly 100 pages of color photos and illustrative works done in Colella’s own studio. While this slender volume serves as a splendid guide to this quirky harbor community, it also contains substantial scholarship and information missing from more sober historical accounts..."
"This book is a much-needed guide to our waterfront treasures. Sausalito has a rich boatbuilding heritage. This guide will enhance any visitor's understanding of that heritage." " .. Sausalito’s rich maritime history is most definitely alive on its waterfront. In fact, a good part of this historical litany has recently been captured in a new book entitled the Sausalito Wooden Boat Tour, which was written, illustrated and photographed by Victoria Colella. This new book, with its captivating stories and pictures, serves as a great guidebook, a unique gift and memorable keepsake...."
"As a lifetime sailor on San Francisco Bay, a sixty-two resident of Sausalito, and a lover of wooden boats, I want to congratulate Victoria! You have really produced a book that every visitor and boat lover should buy." Latitude 38 "Page Turners '03 reports .."we learned alot and thoroughly enjoyed this delightful little book"